Accessibility measures to population, employment and labor by auto and transit for the period of 1995, 2000, 2005, 2010 for the Twin Cities region. Auto accessibility measures to non-work destination, e.g., retail, entertainment, food/restaurant and recreation, for the period of 1995, 2000, and 2005 for the Twin Cities region. Unfortunately, due to small methodological changes, these data are not directly comparable with more recent outputs, and the 1995 – 2005 data are really not directly comparable with the 2010 data either. It nevertheless might be interesting for selected applications. The 30 minute city is a concept about accessibility, can the important places travelers want to go be reached in a given time. 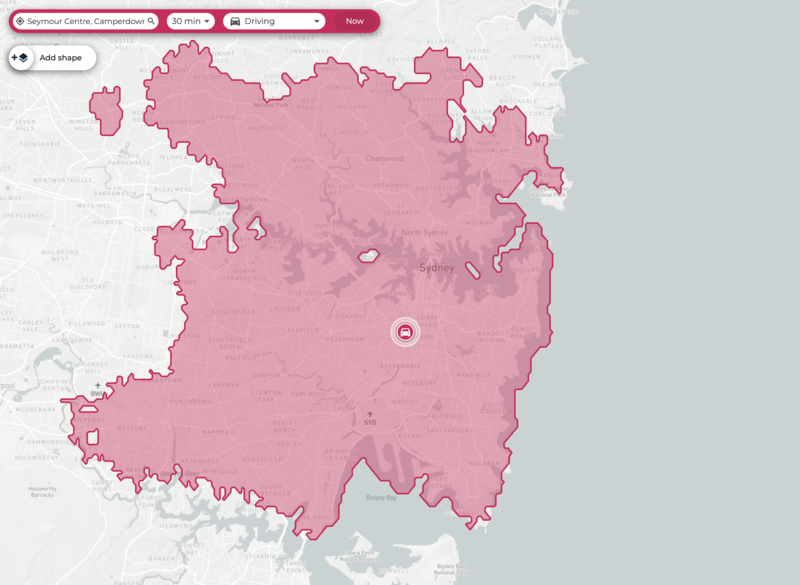 The idea that 70% of the people can reach daily activities within 30 minutes of walk, bike, or transit is embedded in the most recent Metropolis of Three Cities plan of the Greater Sydney Commission. Isochrone by car. A car will get you farther than walking, biking, or transit in 30 minutes. This study estimates the accessibility to jobs by auto for each of the 11 million U.S. census blocks and analyzes these data in the 50 largest (by population) metropolitan areas. Travel times are calculated using a detailed road network and speed data that reflect typical conditions for an 8 a.m. Wednesday morning departure. Additionally, the accessibility results for 8 a.m. are compared with accessibility results for 4 a.m. to estimate the impact of road and highway congestion on job accessibility. Rankings are determined by a weighted average of accessibility, with a higher weight given to closer, easier-to-access jobs. Jobs reachable within 10 minutes are weighted most heavily, and jobs are given decreasing weights as travel time increases up to 60 minutes. The report presents detailed accessibility and congestion impact values for each metropolitan area as well as block-level maps that illustrate the spatial patterns of accessibility within each area. It also includes a census tract-level map that shows accessibility patterns at a national scale. Minnesota Compass collects social indicators to measure changes over time in Minnesota across a variety of topics, including transportation, education, economy and workforce. Of interest to Transportationist readers are transportation indicators. These include congestion, pavement condition, transportation expenses, and accessibility, from the Accessibility Observatory. Check it out if you are interested in performance and trend tracking. As keen readers of this blog or my twitter feed know, the Accessibility Observatory released Access Across America: Transit 2014 this week, with an official University of Minnesota Press Release and Maps. This post links to third party coverage and interpretation of the report. Jacob Anbinder @RealClearPolicy: New York: Best Mass Transit in the Country? Emily Badger @ Washington Post WonkBlog: Mapped: How public transit changes your job prospects. Susan Bregman @ The Transit Wire: Researchers measure transit access to jobs. Alex Davies @ Wired: America’s 10 Best Cities for Commuting on Public Transit. Eric Jaffe @ City Lab: The Carless Commute Ranking to End All Carless Commute Rankings. Randal O’Toole @ The Antiplanner: Irrelevance Across America. Robert Poole @ Reason Foundation – Surface Transportation News: New Findings on Access to Jobs via Transit. Angie Schmitt @StreetsBlog: The 10 Best and Worst Cities to Catch a Bus to Work. Lisa Schweitzer @ Urban Ethics and Theory: David Levinson’s metro job accessibility report is out, and it’s vital for planners interested in transit. Alissa Walker @ Gizmodo: The 10 Best American Cities for Riding Transit To Work. Jarrett Walker @ Human Transit: Access across America! Michael Theis @ Austin Business Journal: Austin businesses among least transit-accessible in nation. Yonah Freemark @ Crain’s Chicago Business: Before you complain about the CTA again, read this. Jason Williams @ Cincinnati.com: Study: Region offers poor transit access to jobs. Phil Tenser @ 7News: Denver ranked 9th for access to jobs by public transit. Dug Begley: The Highwayman @ Houston Chronicle: Despite complaints, Houston best Texas city for transit access. Bianca Barragan @ Curbed: LA is the Third Best US City For Public Transit Commuting. Steve Hymon: Metro’s The Source: Transportation headlines, Oct. 8: L.A. ranks 3rd on jobs near transit, study says. Jacob Ryan @ WFPL: Louisville Ranks 36th In Accessibility to Jobs by Public Transit, Study Says. Bob Collins @ MPR NewsCut: New study measures value of commuting transit. Cali Owens @ Minnesota’s Finance and Commerce: U of M research ranks job access by transit. Eric Roper @ Star-Tribune’s MPLS blog: MAP: The best places to be a Twin Cities transit commuter. Aaron Rupar @ CityPages: Mass Transit Study Ranks Twin Cities 13th, but Doesn’t Include Green Line. Editorial Board @ Minnesota Daily Metro can do better in transit. Shari Rose @ The Arizona Republic: Phoenix ranks No. 19 most accessible to jobs by transit. Joseph Rose @ The Oregonian: Portland public transit nation’s 11th best. Vianna Davila @ San Antonio Express-News: Want to reach your job using the bus? Set aside an hour. Sean Keeley @ Curbed: Seattle is the 8th Best U.S. City For Public Transit Commuting. Robert Trigaux @ Tampa Bay Times: Perspective: Getting from home to work. Our Access Across America: Transit 2014 report is now out. The report (CTS 14-11) and methodology (CTS 14-12) can be downloaded from the Accessibility Observatory. Accessibility is the ease of reaching valued destinations. It can be measured for various transportation modes, to different types of destinations, and at different times of day. There are a variety of ways to define accessibility, but the number of destinations reachable within a given travel time is the most comprehensible and transparent, as well as the most directly comparable across cities. Rankings are determined by a weighted average of accessibility, giving a higher weight to closer jobs. Jobs reachable within ten minutes are weighted most heavily, and jobs are given decreasing weight as travel time increases up to 60 minutes. This report describes the data and methodology used in the separate publication, Access Across America: Transit 2014. That report examines accessibility to jobs by transit in 46 of the 50 largest (by population) metropolitan areas in the United States. Transit is used for an estimated 5 percent of commuting trips in the United States, making it the second most widely used commute mode after driving. Rankings are determined by a weighted average of accessibility, giving a higher weight to closer jobs. Jobs reachable within ten minutes are weighted most heavily, and jobs are given decreasing weight as travel time increases up to 60 minutes. The research was sponsored by the Center for Transportation Studies at the University of Minnesota. Accessibility Observatory reports, including the analysis of job accessibility by auto published last year Access Across America: Auto 2013, and interactive maps are available for download at: access.umn.edu/research/america. Visit the site to see the reports, rankings, data, and maps. Transit Accessibility in Minneapolis region. Ranked #13 as of January 2014. This study describes the development and application of a set of accessibility measures for the Twin Cities region that measure accessibility by the automobile mode over the period from 1995 to 2005. In contrast to previous attempts to measure accessibility this study uses travel time estimates derived, to the extent possible, from actual observations of network performance by time of day. A set of cumulative opportunity measures are computed with transportation analysis zones (TAZs) as the unit of analysis for the years 1995, 2000 and 2005. Analysis of the changes in accessibility by location over the period of study reveals that, for the majority of locations in the region, accessibility increased between 1995 and 2005, though the increases were not uniform. A “flattening” or convergence of levels of accessibility across locations was observed over time, with faster-growing suburban locations gaining the most in terms of employment accessibility. An effort to decompose the causes of changes in accessibility into components related to transportation network structure and land use (opportunity location) reveal that both causes make a contribution to increasing accessibility, though the effects of changes to the transportation network tend to be more location-specific. Overall, the results of the study demonstrate the feasibility and relevance of using accessibility as a key performance measure to describe the regional transportation system.